Allison Bennet (Rachel Boston), along with her daughter Olivia and mother Martha (Patricia Richardson), run a bakery in the small mountain town of White Pines, Tennessee. 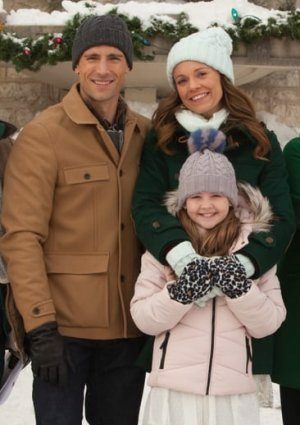 When Matthew (Andrew Walker), a charming real estate developer, tries to buy the town for a corporate ski resort, Allison and the townspeople must work together to prevent that from happening. And just when the Bennet ladies seem out of luck, an unexpected visitor – with a well-known sweet tooth for cookies and milk – comes to the bakery and may in fact be the key to solving everything. Is a very enjoyable movie. I don’t know what movie richard jones watched but this is nothing like a Netflix movie. Not sappy or boring like some holiday movies are. Great cast with a nice spirit for Christmas. Rare family movie. I am a huge Andrew Walker fan. The 1st movie I saw him in was A Bride For Christmas. I’ve watched “non-Christmas movies too. So cute and a “believable” actor. This is a total rip off of a Netflix Christmas movie, based in Tennessee, where a music star comes back home to save the place from being sold to corporate muckety-mucks. EXACT same movie. lame. Don’t take these movies so seriously. They all basically have the same plot. Busy career woman comes back home due to a family crisis and finds a carpenter that helps her understand the meaning of Christmas and love. It works. It’s fun. It’s innocent. It’s Christmasy. It gets us in a good mood. What’s wrong with that?